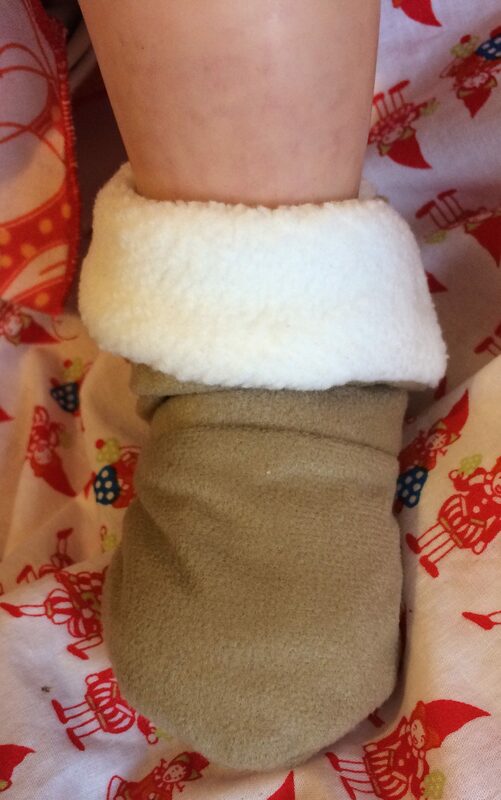 I wanted some ‘ugg’ style boots for a newborn doll but newborn shoes and booties tend to be ginormous and never fit the size they say they will so I asked around for a maker. I wanted a treat and I’m not the best at shoes but no one came forward so off I went to ebay to get my supplies. I couldn’t find any free patterns I liked but I did find pictures. I used this one and printed it off to my sizing. You will need to save the image off pinterest as the link doesn’t take you to anything remotely foot related. There are also other style if have a nose. The foot size I wanted was 9 cm from toe to heel so I copied off the pattern at 11 cm to give myself plenty of seam allowance. Better too much than not enough as you can always trim it. You will have 2 soles per boot, 2 toe pieces and 2 ankle pieces. 1 of lining which I bought cream fleece for and 1 of outer which I bought faux doe suede in beige for. The one I’m using has directions for where to place what I placed my toe section on wrong size of the ankle part but I wanted a fold over so for me it worked. When cutting make sure you cut opposites so you’ve a left and right. First place the flat side of the toe section on the ankle part as shown. Must be on the same side as the tab if you want fastening tab to be on the side/back of bootie. Repeat for other foot and outer parts. I found it better to place this approx 1cm from side. once shown fold it down out the way and put the short sides together and sew where line indicates. When meeting edges pretend the tab isn’t there. At this point I decided to add the velcro on. Add your first piece to the fleece tab and your second piece needs to go on outside of boot. To determine where I folded the ankle section like they were being worn and marked where tab folded over to taking into account seam allowance. Should be approximately placed like this. Next we need to put the sole onto each part. Match the front and back of toe and ankle to same parts on sole. Provided you have opposite pieces and attached them in same way when sewn on you will have 2 outers and inners that mirror each other with the fastening tab on opposite sides. If you don’t check you have opposites and everything is on same side. Pin round the toe. When you get to the small flat edge on the toe section you need to pull it so meets the side of the sole. Like 2nd picture. I had a bit that hung over than I had to chop. Sew round the whole thing. Repeat for other shoe and outer’s. Now Turn your lining right side out and your outer wrong side out and put the lining inside the outer boot. You will now sew round all the cut edges making sure to leave a gap to turn it all out. I started by the green and sewed round to the blue leaving a gap at the side. Turn out and hand sew the gap closed.